Tie Bars - Control movement of the center and second tread blocks for low rolling resistance and long, even wear. Continuous Shoulder - Offers long, even wear and reduced rolling resistance by controlling movement of the ribs and blocks during rotation. Flow-Through Design - Allows for water evacuation to enhance road grip. 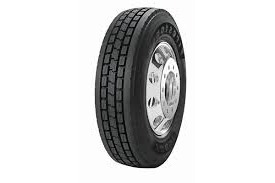 Deep Tread - Deep 26/32nds tread means more original tread life for high removal mileage.